Royal Rent-A-Car Has Gone Mobile! Travelers looking to reserve a car on the run can now visit Royal's new mobile website for all their rental needs. Travelers looking to reserve a car, truck, SUV, mini-van or 15 passenger van in Miami or Fort Lauderdale can now visit the all new mobile-optimized website and take advantage of late model vehicles, huge savings, and friendly service; all from their mobile phone. 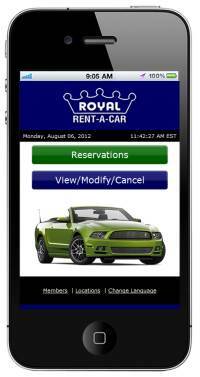 Travelers that use iPhone, iPad, Android or Blackberry devices need only navigate to the Royal Rent-A-Car mobile website located at http://mobile.royalrentacar.com. They will be presented with the option to create a new reservation, view or cancel an existing reservation. Creating a new reservation couldn't be any easier, thanks to the step-by-step process that guidance the customer through a fast and easy process, starting with the car rental dates. That is not all: customers can even take advantage of the popular PAY NOW option which showcases a side-by-side comparison between the standard rate and the discounted PAY NOW rate. In fact, customers that choose the PAY NOW option can save up to 25%! Choose from a wide range of vehicles offered by Royal Rent-A-Car. The fleet consists of all late model vehicles from leading manufacturers including Ford, Lincoln, Toyota, Jeep, Kia and Volvo. Customers can also take advantage of additional insurance coverage options, GPS, prepaid toll program and prepaid fuel deal.